Reunions Hall of Fame is a testament to reunions. 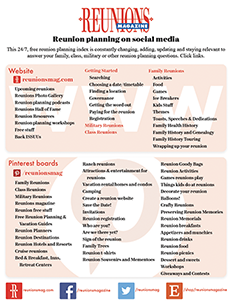 It starts as the list of reunions who have contributed to Reunions magazine during its first 28 years, and will grow as new reunions are added in print or online. It demonstrates the generosity of many reunion planners who celebrate their special relationships with family, classmates, buddies and friends. One of the hardest jobs we had birthing Reunions magazine 28 years ago was finding reunions to share their stories. But in no time, reunions found us—literally! Many thousands have shared their reunion stories and photos. Then, since the dawn of the internet, our website has provided 24/7 reunion planning information and lots more reunion stories and pictures. Those thousands of reunions, and more to come, constitute the Reunions Hall of Fame. Reunions Hall of Fame members added pictures, stories and reports to our print and web pages and they announced their reunions on our list of upcoming reunions, first in the magazine and then online. They shared their pictures for many uses, most notably to illustrate their own stories. And those pictures are a visible representation of the countless families, classes, military and other groups who embrace their nostalgia and gleefully reconnect. The Reunions Hall of Fame you find today is a list of 28 years of reunions and counting. We will soon add pictures of the reunions from those that have graced our 120+ print magazine and workbook covers, many facebook pages, newsletters, website pages, and Reunions Picture Gallery — because our favorite photos are the ones from the heart of reunions! Find your reunion in the Reunions Hall of Fame at reunionsmag.com. If yours is a common name and there is more than one reunion by that surname, distinguish your group. If it’s a family reunion, send the names of descendants of … Where there’s more than one reunion from a school, send Class of ________. And for military reunions, if there’s an era, send that. Note: The section on reunionsmag.com that archived reunion listings is being replaced by Reunions Hall of Fame. We archived reunion listings to preserve the contact information, but no longer post it live. For Reunions Hall of Fame, we invite you to add current contact info, email, phone number, website, Facebook page, Or any other digital media sites. Send to editor@reunionsmag.com. How to add your reunion in the Reunions Hall of Fame! Add your reunion to our list of upcoming reunions.